Chou Chou! 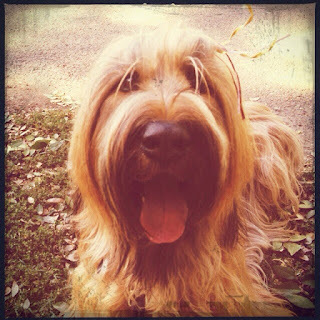 Adventures of a Briard Girl : Pup Failed Potty? Chou Chou Briard is beginning agility lessons. She doesn't know the rules yet. Before she enters the agility field, she has to go potty. If dogs peed in the agility area, other dogs would want to sniff, not work. It was getting late, so we had to get in the car without the potty. We crept through evening rush hour traffic, arrived slightly late, and she still had to go potty before she entered the field for her lesson. I had an idea. There was a large, enclosed field next door to the agility teacher's home, where dogs can run and it's okay to potty there. Maybe if I took Chou Chou into that area, and she ran for a few minutes, she would go? Worth a try.